Since I collect not just new and not just old but REALLY old rangefinder (and direct-view) cameras and like to take them out and take photos with them, I am always on the lookout for ways to make my photography easier and more enjoyable. Some of my elderly cameras either don't have rangefinders, or they're broken, or they're just too dim with age, etc. And my vision is not what it was, either. I have gotten better at manually judging distances - and I am getting better at guestimating what the approximate depth-of-focus for a given lens at a given aperture would be, and this gives me a range for error that often works pretty well. But there are times when I really want to nail the distance, and (assuming that my lens is calibrated properly for distance), use a really open aperture to give maximum out-of-focus effects an all but my chosen subject. I could bring a measuring tape - this would work fine in many circumstances. I could use a string with known distances marked on it or knotted in the cord - an old trick that still works well. I could guess the distance. I could pace it off and count my footsteps. But I guess I think it would be cool if I could just stand where I am and get a really accurate distance reading. Just to get one variable out of the way, anyhow, with a minimum of fuss. I thought about the types of 'rangefinder' that are sold today. These are primarily used for things like golfing, hunting, bow hunting, and general contracting. They're not that much use for a shutterbug, since they are more interested in distances beyond what we'd set as 'infinity' on our lenses - and their factor of error is well beyond what we'd consider acceptable anyway. And some of them cost the world anyhow. I thought it just might be useful for me. Looks like it goes for about $49 mailorder, uses a 9-volt battery, and measures what I'd consider a useful distance - 1.5 feet to 60 feet. It will display in feet/inches or meters or yards. Uses a visible laser so you can see what you're getting your distance from. Drawbacks? Well, one more thing to carry around. It's small, but not tiny. Doesn't look like something I could clip on a camera accessory shoe. Apparently, it gets distance from flat objects better than objects with lots of craggy nooks, and clothing, etc. I'd have to test it to see how well it did outdoors in daylight. And of course, with the laser pointer, you'd have to be really careful not to point it at people - so using it for portraits would require some care (like telling your subject to close his/her eyes for a moment). And I guess I'd be very careful not to shine it in any airliner cockpits (!). But it might be worth a try. I think I'm going to order one, I'll test it out and let people know how it works out. But I thought I'd pass on the information in case anyone else feels like experimenting too. I have used Nikon and Bushnell rangefinders for years while hunting in Colorado, it's amazing how you can misjudge the distance across a valley. I don't think they project a "beam" onto the subject but I may be wrong. I also don't know what the minimum distance is, which could come into play if close measurements are needed. I almost forgot, after reading my post I remembered I also use a handheld laser measuring tape for construction and bidding jobs at work (so there goes our fortune Bill), they aren't very big and you can get them at Home Depot, Lowes, Ace, Sears, etc. I looked at the ones for 'hunting' and they seem to start measuring at like 30 yards and out to 1,000 yards. A good range for hunting - not so for a rangefinder camera that is already at infinity by 50 feet tops. They also say they are accurate to 9 yards either way. That's 18 feet plus/minus - the error rate covers the entire useful spectrum for a rangefinder camera! And man, they are expensive! I will stop by Lowes tonight and see what I can find. If a laser measuring tape is accurate enough and fits the right range (it should) then that would do the job for me! I believe that the inexpensive ones use the laser as a pointer but use sonar for the actual distance measurement. Because of this, I don't think they're that accurate because the sound beam is to wide (hence the need for flat surfaces). Find More Posts by Nick R.
Originally posted by Nick R.
I'm just discovering that, but thanks for pointing it out! Yes, apparently the laser is for seeing where the ultrasonic beam is vaguely pointing. You're right, it is not as accurate as a real laser for measurement would be (the Leica Disto apparently does that, but costs approx $400). However, apparently the inaccuracy only amounts to around .5 percent or 3 feet at 50 feet - that's ok for my uses if it is really that good. I think I may try it - there is also a unit made by Zircon that projects several laser beams that spread out along the same lines as the ultrasonic wave to outline where the actual wave it hitting (spreads out as it goes) and it costs $10 more - about $59 USD. That might be just the thing. Worth a try, anyhow, eh? bulky. Maybe some better ones out now. I've worked with this kind of mesurement tapes, and they aren't very accurate from my job POV, I work as an architect and have had some experience with them, but for taking pictures and finding the right focus it may be accurate enough. You can go here to find some helpful rangefinder list. Love to help people by providing relevant content. I thought about adding a laser pointer to a side mounted Kalart rangefinder in the spirit of the Kalart focus-spot accessory. Even replacing the regular focus-spot light with an LED penlight with a lens is a world of difference. 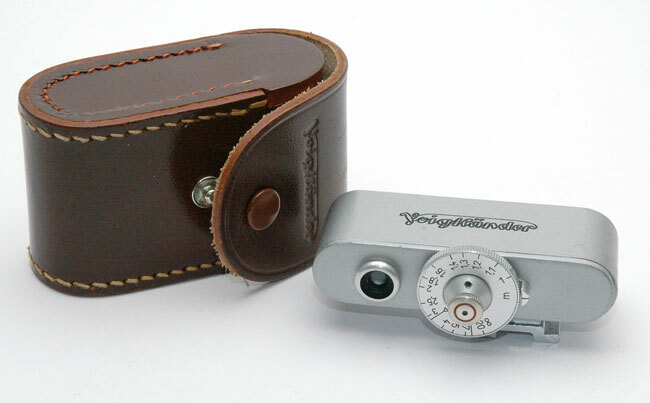 This only works with Graflex cameras out of the box but you could easily adapt it to any coincident rangefinder. Laser dots on public figures sometime result in unexpected consequences. Like you, I learned to practice guessing distances and got pretty good at it. However, I suspect that what you find on say a measuring tape or laser rangefinder readout is not going to translate exactly to the distance markings on your lenses, which will result in approximating where to set the distances anyway. The reference to SLRs was made only half in jest, because if (for instance) you want to get just the eyes in focus on a subject w/ a fast lens wide open, you really need an SLR for that. Same w/ close distance focusing made wide open. What you see in the viewfinder will be exactly what you will get on your neg. There's also the idea of using more modern cameras. I have a Nikon AF n8008s that is used with older Leica R and other non Nikon manual focus lenses. It has a focus confirmation light in the bottom corner of the viewfinder. When the green dot is on you have exact focus. Not exactly sure how that system works, but it is extremely accurate. To my great disappointment, I am really bad at estimating distances. I suspect that I could train and improve. For now I have come up with this. It can measure from 6" to 30', and can display in metric or inch so it is good for any of my cameras. It is a class 2 laser though, and should not be used on anyone's face. It's a bit of a garish colour, but some paint could fix that. We have a Bosch laser rangefinder at work that has proven to be very handy, but it is too large to be fitted to flash shoe. I like the size of the little Stanley that you found. I'll have to check them out next time I'm at the home improvement store. With my progressive eyeglasses, I find focusing to be less of a surefire thing, so having a laser rangefinder slung around my neck along with the old Gossen light meter might make for fewer out-of-focus shots. It used to be possible to buy accessory rangefinders that slipped into the accessory shoe of an old camera - peer through the rangefinder and rotate the wheel till the images coincided. Read the distance on the scale shown on the wheel, then focus the lens manually at the same distance. Worked quite well I recall. (I bought an old one I found in a camera store bargain box). In all probability they turn up on EBay from time to time. This is identical to the one which I own. As a total aside: One thing I miss is my old Nikonos with its Nikkor 35mm f2.5. That lens had an inbuilt zone of focus indicator which opened and closed automatically as you adjusted the lenses aperture and focus point (nearer subjects having less DOF than ones which are far away. I have seen something similar on some Kodak Retina lenses. As the Nikonos had no rangefinder this was necessary as was the the ability to guesstimate the distance enough for it to be able to be within the zone of focus indicated by the lens. It did not do away with the need to estimate distance but it still helped. You can see below in the photo of the Nikonos IV-A where the indicator shows that everything from little over 1.5 metres to 10+ meters is in focus at f 11 when the lens is focused at a distance of 3 metres. I loved that system though it worked less well under water where low light demanded wider apertures and would work even less well still on longer lenses.